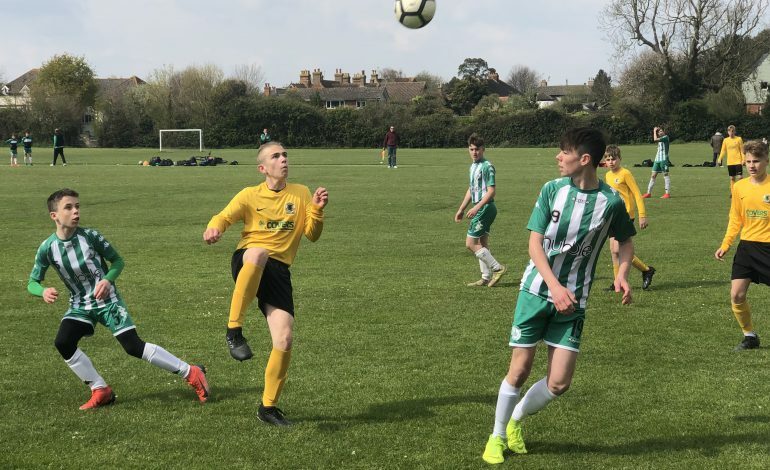 The battle for the Arun & Chichester U14s league title looks set to go down to the wire after the division’s top two sides shared the points in a tense affair in the cathedral city. With leaders Chichester holding a one point advantage over the Hornets, having played a game more, both teams knew they could afford no slip-ups if they are to claim the silverware at the end of the season and this produced a much closer-fought affair than when the pair met in the League Cup Final three weeks ago. Then the Hornets enjoyed a fairly comfortable afternoon, winning by three goals to one, but Chi looked determined to avoid a repeat performance and took the game to their opponents from the start. However, the Hornets went close to taking a fifth minute lead when a Sammy Henderson free-kick was met by a sensational overhead kick by Connor Colcutt that came back off a post. Following up, Max Morris’ attempt to put away the rebound was deflected onto the crossbar before the ball was hacked clear. 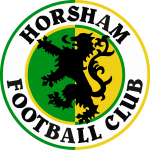 But for the next quarter of an hour it was a case of Horsham’s defence holding firm as the hosts went all-out to claim the psychological blow of scoring the game’s opening goal. A well-timed block by Alfie Furneaux put paid to Zach Barnett’s hopes of testing Will Scurr in the yellows’ goal, from a neat Kye Hartt lay-off, before the goalkeeper’s agility was brought to the fore when keeping out a twenty-five yarder from Lewis Thorne, Scurr rising quickly to his feet to get in the right position to field Ryan Harfield’s follow-up strike. 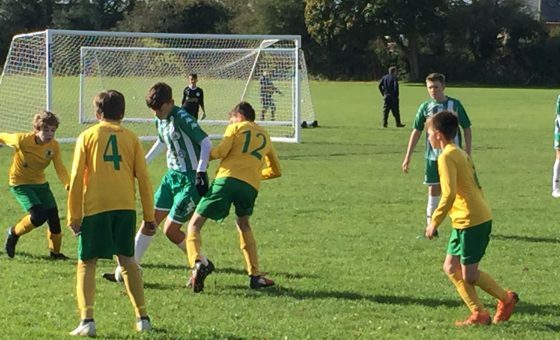 The Horsham goal received a further let-off, a minute later, when Harfield latched on to Dan Hubble’s long ball forward to lob Scurr only to drop the ball onto the roof of the net. Another Thorne shot from distance just cleared the crossbar before the Hornets finally fashioned a chance for themselves when Zain Beg nipped in ahead of a defender to take the ball to the goal-line and cut it back in to the path of Collcutt, who fired straight at the ‘keeper. The better chances, though, continued to come at the Horsham end of the pitch and Scurr showed a good pair of hands to hold a free-kick by Hartt. Terriq Osman couldn’t quite wrap his foot around the ball sufficiently to direct a volley on target, the ball sliced harmlessly wide from a dangerous position, and then a rare mistake from Henderson gifted a shooting chance to Rory Pack, whose left-footed shot was saved well by Scurr with his legs. Another good run by Beg saw his ‘give and go’ with Max Warren quickly snuffed out on the edge of the Chichester penalty area before the home side went close on the cusp of half-time through an audacious effort from Joe Masters, his thirty yard strike dropping inches over the bar with Scurr beaten. Just as they had done in the first half, Horsham threatened to score just five minutes after the restart when half-time substitute Nico Massimo and Isaac Small combined for Henderson to cross for Beg to hook the ball goalwards. As goalkeeper Owen Dawson parried, Massimo was on the spot to knock the ball over the line only for Beg to have already been ruled offside. It was, though, an encouraging start for the visitors who might have taken a somewhat fortuitous lead when a cross into the box cannoned off a defender and against the shins of Ollie Herring, who was grateful to Dawson’s sharp save for preventing an own goal. Beg then tried to take advantage of some uncertainty in the Chichester defence when Herring struggled to deal with a long ball over the top and the Horsham striker nipped in to try and lob the ball over Dawson, slightly underhitting his shot and enabling the ‘keeper to get back and save. The Hornets’ bright start was rewarded with a goal, eleven minutes into the half, when Collcutt ghosted into the area to take a Furneaux cross in his stride before coolly tucking away his seventeenth goal of the season. Chichester responded well to this setback, though, and went close to equalising from each of two quickfire corners. From the first, swung dangerously into the middle, Scurr palmed the ball up onto the crossbar before Collcutt completed the clearance and, from the resulting set-piece, Barnett’s downward header was pushed off the line by the busy ‘keeper. Pack then had a sniff of goal but was well kept out by a combination of Henderson and Phelan Jeffery before, at the other end, Hubble did well to deny Max Warren from taking advantage of Massimo’s clever defence-splitting pass. From Collcutt’s corner, Beg flicked the ball on, Max Morris hooked it back across goal where Furneaux was prevented from turning the ball over the line by the heroics of a Chichester defender. The second half was developing into a much more even contest than the first, with Chichester determined to claw back that one goal deficit and, after Hartt’s terrific strike had flown just too high, they got themselves back on terms. A long ball out of defence saw Small and Harfield get in a tangle after Scurr had failed to claim the ball and, when the two players went down in a heap, the referee awarded a penalty to the home side that was duly converted by Hubble, despite Scurr getting a glove to the ball. 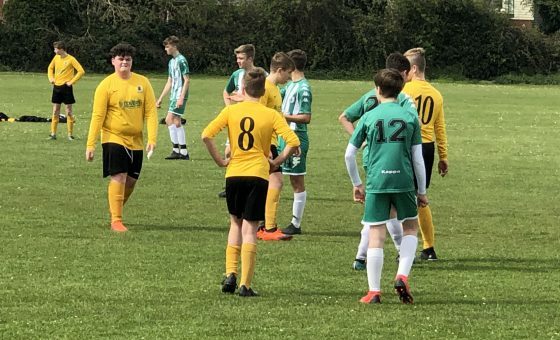 Although a share of the spoils would not be disastrous to either side, they both went all-out in the closing moments in search of a winning goal. Beg headed a huge Henderson throw over the bar, Henderson had two efforts – one going too high and the other to close to the ‘keeper – and then Scurr saved long range strikes from Hubble and Masters. 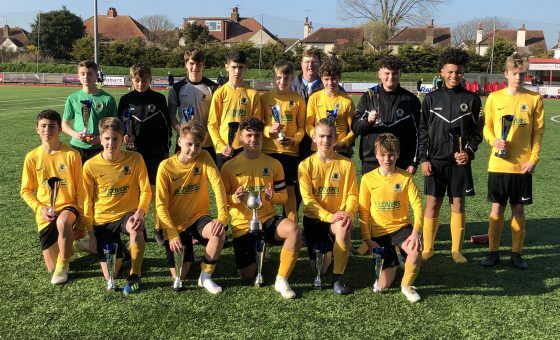 Horsham survived two late corners before the final whistle, with attention now on their home match with Littlehampton Town on Wednesday 24th April. Win that, then they need merely to avoid defeat in their final match to win the title. Their opponents for that season’s finale? None other than Chichester City!